Aion is a Free-to-play game you can play on PC, Steam and Consoles. 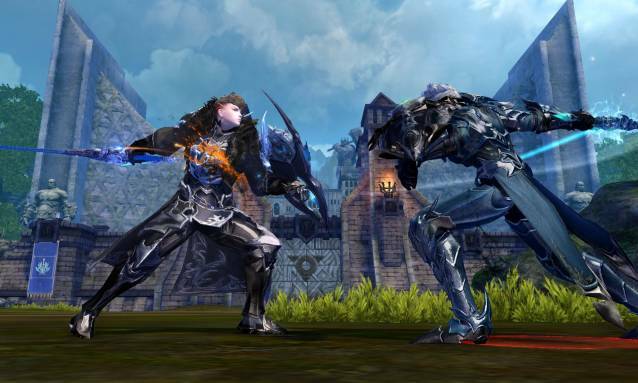 Aion is a typical feature packed MMORPG with a variety of expansions and updates that have kept it fresh, constantly adding content for new players and is one of the biggest MMORPGs of all time. Players will create a character, complete quests in order to level up, unlock new skills, acquire new gear to make them more powerful and then face even greater challenges, whether group based or Legion (guild) specific instances or even facing other players in the PVP Arena. One key area of the game is the ability to fly, with players earning their wings earn in the game once they Ascend; they can use flight in specific Flight Areas , with full vertical flight, each character has a flight gauge lasting sixty seconds before they must glide to the ground, but this time can be increased as players level up and by acquiring certain items and wearable gear. Flight is useful for traveling around the world, but the game also allows players to battle in aerial combat against AI controlled enemies or against other players in PVP. Depending on who you ask there are two stories behind what brought on the Cataclysm, propagated and retold by the two factions of Daeva that each have their own side to the story. With the worlds division half of this once single race were plummeted into darkness and after centuries re-emerged as a harsh demonic looking race and came to, whereas their counterparts, the Elyos spent centuries showered by the sun and evolved into an angelic like sub-race. The differences between the two, both their appearance, culture and belief system have sparked a war that will last through the ages and consume the entire planet of Atreia. Engineer – Using technology to enhance their abilities they focus on charged up abilities; the Aethertech career allows them to summon technologically advanced battle mounts, as a Gunslinger they use aethercannons and pistols to deal ranged damage. Artist - The only class not to have a sub-class, the Muse takes on the ascension career of a Songweaver, they use their magical instruments to heal and buff allies, debuff enemies, and even deal damage making them a very versatile class.